NUI Galway student Úna McVeigh started her PhD in September 2015. 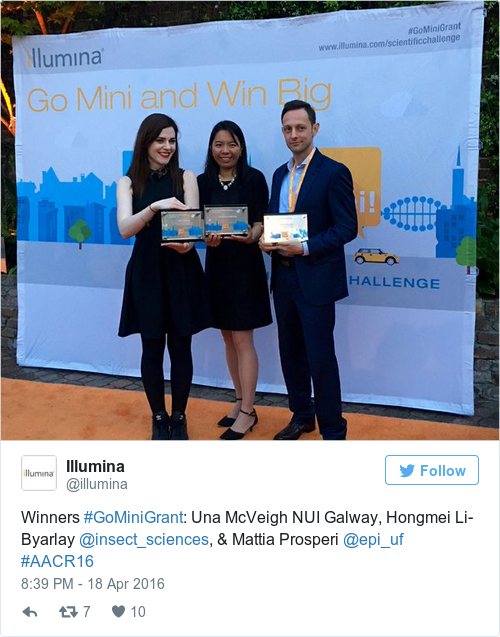 Úna McVeigh is given a prize at a meeting of the American Association for Cancer Research in Louisiana. A SLIGO STUDENT researching breast cancer in the west of Ireland is hoping to open a new front in the fight against the disease. 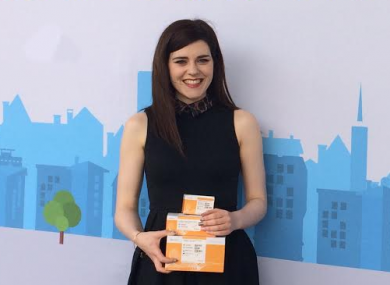 NUI Galway PhD student Úna McVeigh, originally from Tourlestrane, is studying the genetics of the cancer among women with a strong family history of the disease. Her research aims to explain the genetic predisposition to breast cancer not explained by mutations in high-risk genes such as BRCA1 and BRCA2. The study, which uses samples from a large biobank at the university’s surgery department, is focused on identifying women at greatest risk of breast cancer so that preventative measures can be taken before it develops. McVeigh started her PhD, supported by the charity Breast Cancer Research, in September 2015. She said she has “both a professional and personal interest” in her research as her own mother was diagnosed with breast cancer at just 34. “Thankfully, she is alive and well today, but the same cannot be said for many of the women diagnosed around the same time as her,” she said. McVeigh told TheJournal.ie she is studying a west of Ireland population as the area has been subject to less inward migration than others, avoiding the problem of population mixture found in larger studies. The results of her work will have international implications, however, because of the number of people with Irish ancestry abroad. “Validation of significant variants should therefore be applicable to wider populations,” she explained. Earlier this month, McVeigh saw off competition from over 1,100 people to take third place in an international science award. The science student was awarded equipment worth €4,000 at an annual meeting of the American Association for Cancer Research in Louisiana. The Go Mini Scientific Challenge Programme honour will allow her to use cutting-edge technology from US genetic testing company Illumina to aid her research. “Despite the discovery of BRCA 1 and BRCA 2, the majority of inherited predisposition to breast cancer remains unexplained,” she said. Email “Irish student whose mother had breast cancer is researching new ways to identify the disease”. Feedback on “Irish student whose mother had breast cancer is researching new ways to identify the disease”.